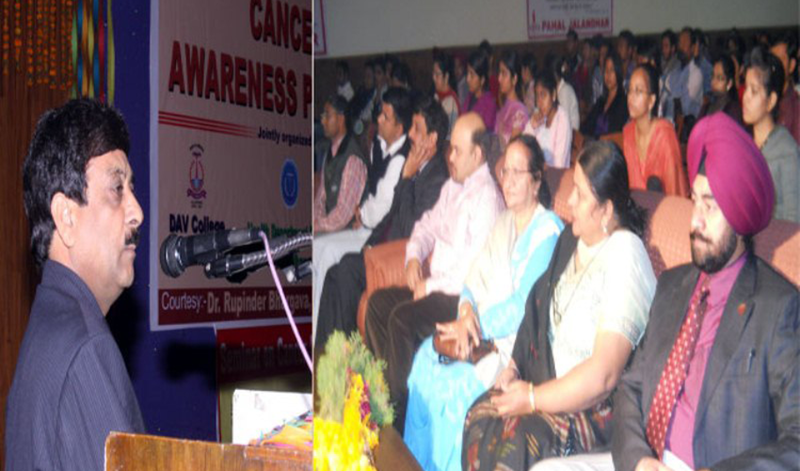 Pahal (NGO) in collaboration with Health Department Jalandhar and DAV College Jalandhar organized Cancer awareness Program in the auditorium of DAV College Jalandhar. Dr. R.L. Bassan DHO Jalandhar, Dr. Satish Kumar Distt. Epidemiologist Jalandhar, Dr. Rupinder Bhargava Cancer Super specialist and Prof. Lakhbir Singh cancer survivor delivered lectures on various aspects of cancer. Dr. Bassan said that Health Department Govt. of Punjab is offering help to the tune of 1.5 lac Rupees to the cancer patients, one can apply through Civil Hospital Jalandhar. Dr. Satish Sharma explained about the early symptoms and stressed upon early detection. Dr. Rupinder Bhargava cancer specialist told that developed countries there is more than 60% reduction in cancer mortality over the course of study among people who had adopted a healthier life style. He explained about the myths and realities of cancer by telling that he performed more than 10,000 cancer surgeries within last 15 years. Prof. Lakhbir Singh President `Pahal’ said that healthy life style and positive attitude play major role in cancer treatment. He explained about the oxygen rich environment and raw foods, He added that Junks foods, GM foods and fats are the enemies of human health and inviting cancer. Dr. Ashwani Sharma welcomed the guests Ms. Aruna Modi conducted the whole program. Among there were Dr. J.K. Wadia Vice President Pahal, Prof. Kamaldeep Singh Vice President Pahal, Ms Gurpinder Kaur Principal Cantt. Board School, Prof. Mrs.Gupta, Prof. Mittal Zoology Deptt. Prof. Rajan Gupta, Prof. Jagwinder Singh, Prof. Mangat Ram, Prof. Gurvinder Kaur, Prof. Simarpreet Kaur and more than 400 boys and girls attended this program.